With its rainforest, abundant wildlife, jungle streams, waterfalls, interesting plant life, secluded beaches, panoramic rocky shoreline, bizarre rock formations and extensive network of trekking trails, Bako National Park offers visitors an excellent introduction to the rainforest and coastline of Borneo. Bako may not have an instantly recognizable star attraction, but there can be very few places in the world that pack so much natural beauty into such a limited area, all just 37 km from Kuching. Its accessibility - and its sheer range of attractions and activities - has made Bako one of the most popular parks in Sarawak. 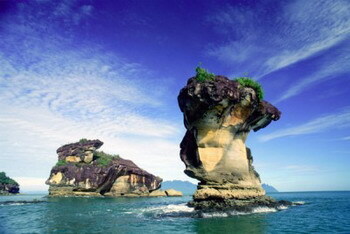 Bako is Sarawak�s oldest national park, established in 1957. It covers an area of 2,727 hectares at the tip of the Muara Tebas peninsula. It is one of the smallest national parks in Sarawak, yet one of the most interesting, as it contains almost every type of vegetation found in Borneo. The well-maintained network of nature trails - from easy forest strolls to full-day jungle treks allows visitors to get the most out of this unique environment. Pitcher-plant can also be found at Bako National Park. It is a carnivorous plant, a meat eater. Apparently insects, particularly certain flies, find the colors of the plant attractive. The inside of the tubular shaped leaf is lined with downward pointing hairs. These hairs block an insect from climbing up the tube and escaping. The fluid in the bottom of the tube contains digestive juices that will consume the insect prey. Situated on a small sandstone plateau, this small park (2,230ha.) boasts crystal clear streams and a host of small waterfalls and bathing pools. Kubah is mostly covered by mixed dipterocarp forest, but it also has one of the widest selections of palms and orchids in Borneo. The varied wildlife includes bearded pig, mouse deer, black hornbill and many species of amphibians and reptiles. Kubah appeal lies in its rainforest scenery, its waterfalls, streams, bathing pools, and the 93 species of palm found within its boundaries. The park has four jungle trails and a path that leads to the summit of Gunung Serapi (5-6 hours return trip). Wooden shelters are located along the various trails. The Main Trail passes through dipterocarp forest and links the various trails of the park. The first section of this trail is called the Palmarium as it passes through an area rich in palms. The Selang trail leads to a view point about 45 minutes walk from the HQ. After about 30 minutes you come to a very steep section where ropes are provided to help with the climb. At the end of the trail you�ll find a raised wooden platform complete with a bench chair and some superb views of Matang and the Santubong peninsula. The Waterfall Trail is the most popular trail in the park. It passes through mixed dipterocarp forest and incorporates a number of plankwalk sections that cross streams and swampy land. From the HQ, it takes about 2 hours to reach the waterfall. The Ulu Rayu trail leads from the park HQ to the Matang Wildlife Centre and takes about 3-4 hours (one way). First follow the main trail before turning right to begin a relatively easy descent through the rainforest. Mid-way along the trail you�ll find some rainforest giants, and pass numerous Bintangor trees which are currently the subject of Aids research. At the end of the trail you enter a swampy section (watch out for leeches) before coming to a crystal clear stream and the riverside picnic areas at the Wildlife Centre. You can also start both the Waterfall and Ulu Rayu treks just past the 900 feet point on the Mount Serapi path. The trek from the road to the waterfall takes about 45 minutes and begins with a steep descent on a wooden staircase that winds its way down the forested slopes. 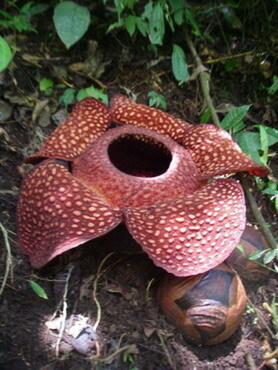 Gunung Gading is home to the world�s largest flower, the Rafflesia, which can grow up to one metre in diameter. When in bloom the flower gives off a nasty smell which attracts flies and other insects. The Rafflesia has no specific season, taking nine months to mature and flowering for only 4-5 days before dying. 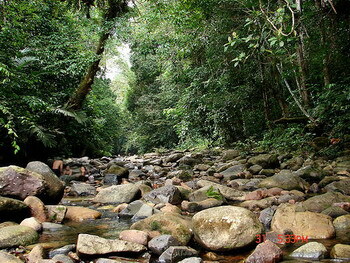 Gunung Gading was only opened to the public in mid-1994, after extensive environmental impact studies. Previously it was used solely as a conservation zone for the Rafflesia. The emphasis is still on conservation, and the National Parks Department have taken measures to allow visitors to view flowering Rafflesia without damaging young Rafflesia buds and other plants. There is a plankwalk close to where Rafflesia are commonly found, and if a plant is flowering deeper in the forest, the park rangers may be able to take you on a guided walk to the site. Please take care, the small brown buds that you see on the forest floor may be Rafflesia, so tread carefully and follow the park ranger�s instructions. Owing to Rafflesia�s rarity and brief flowering period, timing (and luck) are important. Although flowers generally bloom throughout the year, November, December and January can be regarded as the peak flowering season as the frequency of blooms is high. Seeing a blooming Rafflesia is certainly the highlight of a trip to Gunung Gading, but the Park and the whole Lundu area are well worth visiting anyway. The rugged mountain peaks that make up the Park provide a scenic backdrop to the nearby town of Lundu, and the nearby beaches at Pandan and Siar. 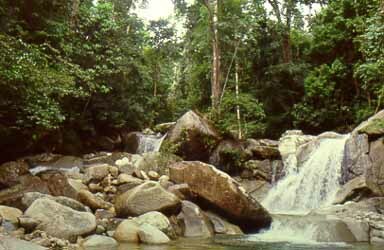 Gunung Gading also has some enjoyable walks and challenging jungle treks.